WritersUA “Early Registration” is open! Register now for the 2012 WritersUA Conference, which will be held in Memphis next year at The Peabody Hotel. You can get all the information from the WritersUA conference web page. Way back in 2002, I started working on training materials for Author-it. This year, I pulled together a book based on those training materials, and it’s now available. Let Author-it guru Char James-Tanny teach you how to get the most from Author-it. Char has taught hundreds in her acclaimed classes, and now she has drawn from her extensive experience to create the definitive resource for learning Author-it. Whether you are new to Author-it or an experienced user, there is something here for you. If you are just starting out with Author-it, Learning Author-it will make the sometimes daunting learning curve for Author-it smoother and easier. You will learn how libraries work, how to wrap your head around Author-it’s object-oriented structure, how to work with your content, and how to publish your output. If you are an experienced Author-it user, get a refresher from someone who uses Author-it like a technical writer. Char provides dozens of tips, helpful screenshots, and more than 150 tasks to help increase your efficiency (and lessen any frustration). And you’ll find lots of tips and tricks that will improve your productivity. Char wrote and published Learning Author-it entirely with Author-it beta version 5.5, except for the front and back covers. The MOTW must start with the comment code and text “saved from url=“. The numbers in parentheses must match the number of characters in the URL string (including the trailing backslash). I’m slowly adding MOTW to the sites I develop…it will take awhile, but because it only helps me in development, there’s no rush. For more information on MOTW, visit MSDN. Don Lammers from Shadow Mountain has informed me that MOTW, when used locally, will prevent links to a PDF from opening, and users don’t receive any warning as to why the links aren’t working. If you have to create links to PDF files, you won’t be able to use MOTW. This only affects those folks developing local HTML-based Help. LavaCon presentation: Getting the Most Out of Twitter…Everywhere! On Friday, 1 October 2010, I presented “Getting the Most Out of Twitter…Everywhere!” at the 2010 LavaCon Conference in San Diego. Jackie Damrau from STC Lone Star Chapter reviewed my session (along with several others and LavaCon) in the October 2010 issue of Technically Write. Ron Miller asked me to write a guest post for Fierce Content Management. Read “What’s all the fuss about net neutrality?” and let me know what you think! Nov 8-12: Take advantage of Char’s visit to Houston! Any topic is fair game, EXCEPT for HTML5/CSS3. Some possibilities include collaborative authoring, creating CSS-based layouts, virtual teams, accessibility, and Help authoring. Companies can choose to “pick my brain” or receive specific instructions on a topic, or a combination of both. Fees will be determined after we discuss what you need. I will cover all expenses (although I won’t say “no” if someone wants to take me to lunch ;-)). A 50% non-refundable deposit is required, which holds your time slot. All deposits must be received by 15 October 2010. Purchase orders for the deposit or entire fee will be accepted. All arrangements must be in process by 28 September 2010. (I have to make travel arrangements that week!) If you make any changes after that date and those changes affect my travel plans, you are responsible for change fees. LavaCon schedule to be posted soon! I’ve been talking to Jack Molisani, and he told me that the schedule will be posted soon. (You are going, aren’t you?) Keep checking the LavaCon site for the latest information! On Tuesday, May 4, 2010, following a lovely meal at Hoffbrau’s with @AngelosTszelpis and Patrick from @LinguaLinx, and with @docguy and @gryphmount, Tom Johnson interviewed Bill Swallow and me. We sat outside a government building in downtown Dallas and talked about free v pay content models. Questions? Comments? Call us at +1 781.598.5129 or send us an email. All content on JTFAssociates.com is licensed under Creative Commons, unless otherwise indicated. 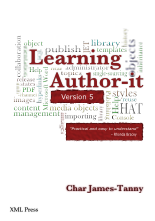 Purchase your copy of Learning Author-it by Char James-Tanny (available in printed and ebook formats). Visit helpstuff.com for your technical communication needs: writing, editing, indexing, training, and more. HAT-Matrix.com lets you create custom searches to help you determine which Help authoring tool best meets your needs. If you're looking for a new web host, check out JTF Hosting. We answer the phone when you call! Ask about our WordPress hosting special.